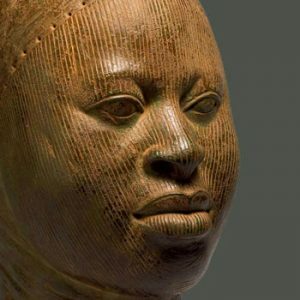 Responding to Rem’s request, here is an image of one of the heads of Ife currently in a show at the British Museum. For anyone who’s read the Stone Dance, it will be obvious why these would appeal to me. Exquisite works of art, these could easily be the pattern for the masks of the Masters. 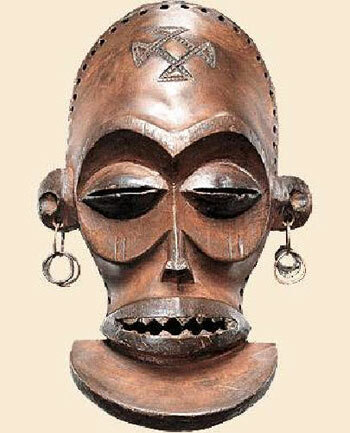 What is rather darkly amusing is that, when they were discovered, it was decided that these sculptures, as well as the more famous ones from Benin, could not possibly have been made by Africans – the heads were, after all, not only made of metal, but artistically at least as accomplished as anything made by the Greeks or Romans. The usual litany of fanciful attributions were made to explain their origins: a lost tribe of Israel, some wandering Roman army, some Greeks merchants who had gone astray, alien visitation yada yada yada. All of this because it didn’t conform with the cosy, racist ideology of the West about what African art was – something more like the second image. Of course, ironically, it was examples of African art like the latter image that inspired people like Picasso to overthrow classicism. A similar hysterical analysis was applied to the ruins of Great Zimbabwe – even though they CLEARLY resembled in form the houses of the local people – which form was entirely determined by their culture and way of life. Though I am reasonably well read when it comes to world history, I was in my 30s before I discovered that Africa had had any urban culture at all. This could be down to some failing on my part. But I suspect it had more to do with a conspiracy of silence that has insisted on portraying Africans as savages in straw skirts, living in mud huts and dining on missionaries. Pah!!! Marvellous stuff – especially the top one. I came across this kind of highly developed culture when I researched a short story, years ago (still have to rejig the English version). This sort of thing does bring the Rider Haggard books in mind, though… Recently reread “She” (and the sequel), and enjoyed them very much. It’s clear that they’ve been of influence.